Believe it or not, in the United States, Volkswagen’s best-selling model is still the Jetta. Yes, even as sedan sales implode, and even with the Golf being as good as it is, and even with two new SUVs newly embiggened and competitively priced for the American market, and even though the compact sedan itself is quite old at this point, the Jetta is what we spend our dollars on the most. The problem is, the Jetta itself hasn’t been all that good in a while. You may remember in the late 1990s and early 2000s how the fourth-generation Jetta was a fixture at high school and college campus parking lots. It was popular with young drivers as this stylish, semi-premium compact sedan that was kind of like a sub-BMW luxury German car. Then VW decided to chase volume over all else, and the Jetta eventually got bigger and fatter. And infamously, cheaper. It lost a ton of luxury in the process in an attempt to become a German Corolla or Civic. Non-GLI models made do with a cheap and uninspiring beam axle rear suspension, so all that European handling character was gone. The point of all this is to say the Jetta served as VW’s poster boy as it attempted to figure out the U.S. market: nice and premium-ish, featuring cheating diesel engines, now scrambling for mass appeal as it embraces the values Germans think Americans want. Which is to say, huge and cheap. For example, the 2019 Jetta will get post-collision braking standard, with optional blind spot monitoring, rear parking assist and adaptive cruise control. “With the platform [strategy], you are producing so many cars, you can afford to offer really state-of-the-art driving assistance, luxury driving assistance, to the customer,” and be competitive on pricing with less contented competitors, Erb said. Which is good to hear, I suppose, because the Jetta kind of needs all that stuff. There hasn’t felt like an outstanding reason to buy the Jetta in some years, at least over rivals like the excellent Mazda3 and also-excellent new Honda Civic. 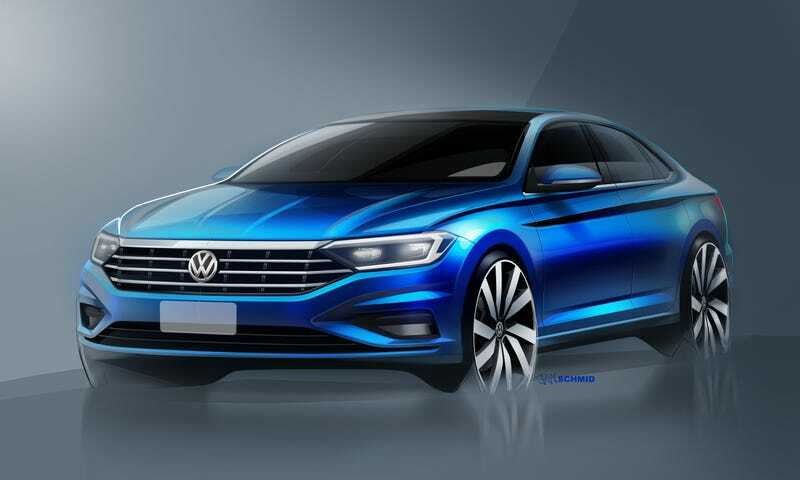 This story says the new Jetta will appear at next month’s Detroit Auto Show, go on sale in mid-2018, and will have a manual gearbox option. The Jetta always worked best when it was a more premium contender in that segment, and these days buyers expect more technology and luxury even in smaller and less-expensive cars. The days of the truly cheap shitbox are pretty much over. Still, if the Jetta’s getting its act together again, it is doing so at the worst possible time. Sedan sales are driving off a cliff as buyers switch to SUVs, crossovers and trucks amid cheap gas. The Jetta’s sales have declined every year since 2012. As Autoblog noted in a recent prototype test drive in the desert, VW considers the Jetta’s 2.1 percent market share simply “not enough.” The way things are going, the same could be said of every sedan.